It is a fact that flying is safer than driving. But there is something unnerving about to board a metal tube and flying at 35,000 feet. Plane crashes do happen, and they can crash in very remote places. If you are lucky then you may experience a successful crash landing like the one in the Hudson Bay a few years ago. If not you may end up on a remote island, just like on the TV show Lost. The thing is that if you prep at home and have enough in your stores to last 5 years for your family, your cousins, friends, and your whole extended family, it won’t do you any good on that remote island. The trick is you have to get around and think about the damn TSA rules. It isn’t hard at all but you need to know the rules inside and out. Believe me, it doesn’t take a genius to outsmart the TSA! You can’t bring any real blades. That is okay because we have some alternatives. You can bring any combination of these items as you see fit. Some of them are redundant so mix and match. The Big Disclaimer: Do your own research. These rules and policies change all the time. Plus, an ill-informed TSA agent can throw out your grandma’s toothpaste because he or she thinks she looks a little funny. Scissors – But only if they are under 4 inches. The TSA says, “metal with pointed tips and blades shorter than 4 inches are allowed, but blades longer than 4 inches are prohibited.” Look for very small sets, like sewing scissors. These work well most of the time and they are all metal. 2 Sealed BIC lighters – They need to be sealed! And, you can’t bring a zippo lighter that has fluid. Cotton balls, Q-Tips, Lint – You can use these for getting the flames going. Large Ferro Rod with Striker Plate – It is wise to separate the striker plate & store it elsewhere. Magnifying Lens – I like the credit card sized lens to keep in my wallet. Simple. You can leave it in there full time. Very Fine Steel Wool – #000 works well. You can use the battery from some of the sources below. Read more here. Water Bottle – It has to be empty going through the search but you can fill up after the security checkpoint. Plastic Cover – It can be a trash bag, small tarp, or a poncho. It can be used for shelter, a solar still, or its intended use. Paracord – You can build a shelter with the plastic & the paracord. Need inspiration?? Here are 101 Paracord Projects to help you out. Emergency Whistle – These can be the difference between being rescued or not. Some high-end whistles are more expensive but can be heard underwater! Check out the WINDSTORM All-Weather Safety Whistle. Rescue Mirror – You can signal your rescuers at a long distance.This Camping Mirror works well for this kind of emergency signaling. An Emergency Blanket – These are small, light, and can keep you warm. The Original Space Brand Emergency Survival Blanket is the one to get. 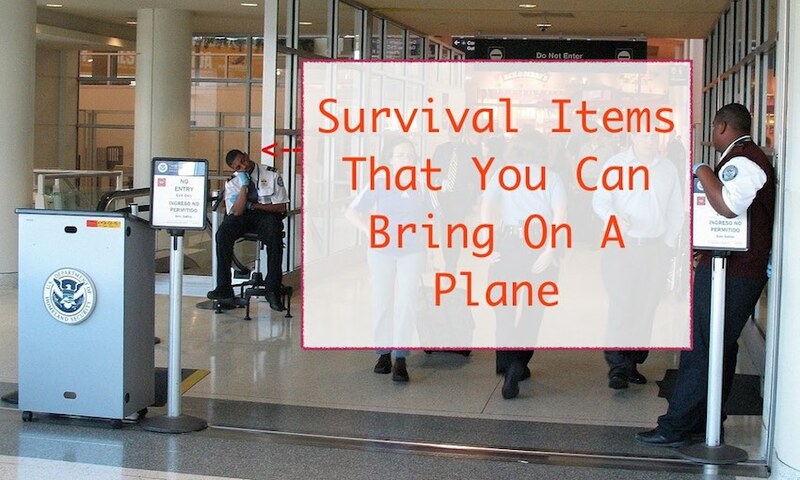 Here is a video that gave me some pretty good ideas about survival items on a plane. Here is the full article from the Organic Prepper. 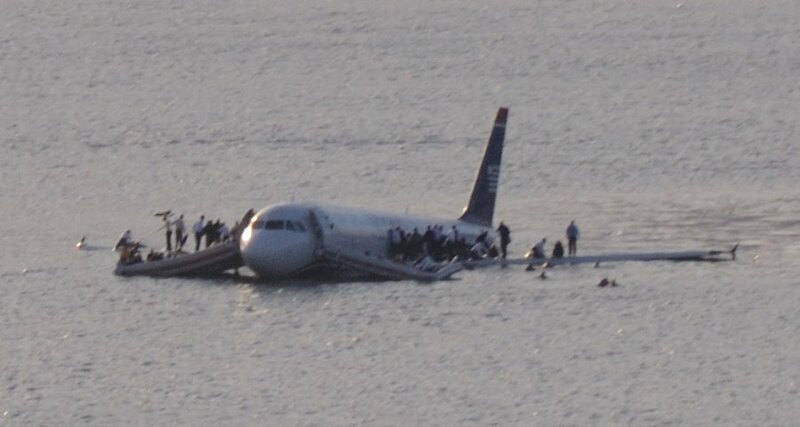 Image Credit: TheeErin, “Plane crash into Hudson River (crop)” by Greg L – originally posted to Flickr as Plane crash into Hudson River. Licensed under CC BY 2.0 via Wikimedia Commons. If you’re into DIY, check out my guide to making your own Bio Filter at home. Backpacking doesn’t mean you have to eat boring, dry food! Today, you have the option to take a stove along on your outdoor trips. Check out my review of the best backpacking stoves on the market today. A garbage tent means you’ll be forking out for a new one very soon. Make sure you get the best you can afford by going with a tent from one of these top brands. Excellent article, very concise and to the point, I have been thinking of this topic for some time and will have to leave my “safe space” for international travel, leaving me and mine at our most vunerable. I would.add a life straw water filter in addition to a bottle with an internal charcoal filter as well as handcuff keys, your shoe laces can be replaced with 550 cord as well as your belt, also pack a tourniquet, some clotting agent, and a small amount of duct tape around your water bottle. Dont forget a simple compass. The blade situation still perplexes me, I have thought of ceramic blades but I dunno. Popper footwear and carry-on back pack will be nessecary.